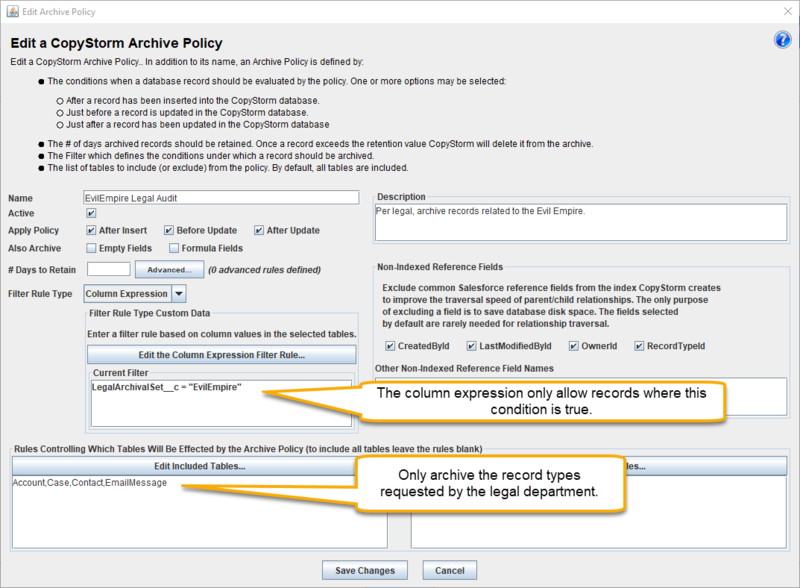 CopyStorm Archive is designed so a user can set up new archives for a variety of purposes. This tutorial describes a realistic scenario and then walks thru the steps to setup the associated CopyStorm Archive. The legal team for the ACME Beach Club has informed the Salesforce administrator that all Account, Contact, Case, and EMail records related to the account Evil Empire need to be archived and any future changes also need to be archived. To prepare for this situation the Salesforce administrator has already added a formula column in Salesforce, LegalArchivalSet__c, that will evaluate to the string “EvilEmpire” for all of the records the legal team wants archived. The next few sections walk to the steps to setup a CopyStorm archive for “Evil Empire” records. The first step is to create a new archive that will only archive tables that the legal department indicated. 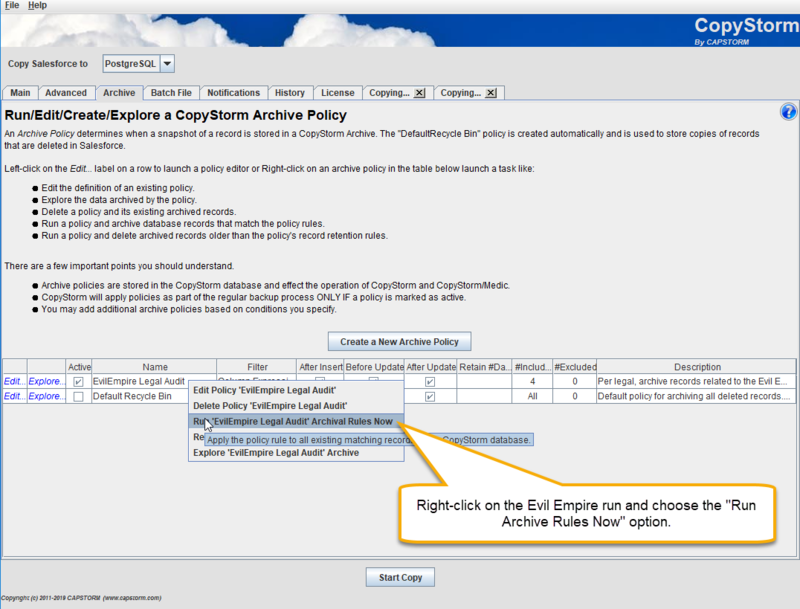 Check the “active” box, save changes and the archive rule will automatically archive “Evil Empire” records that are modified in the future. 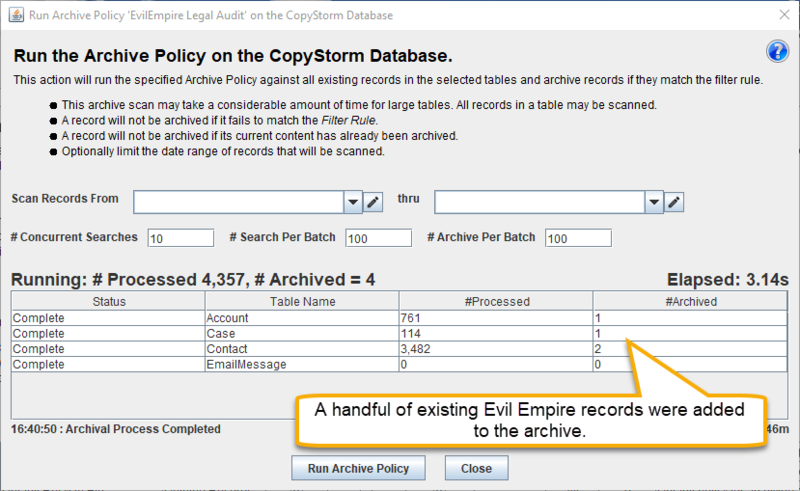 The next step will force an archive of all historical “Evil Empire” records.